Hey look a new page! I don’t have a lot to say right now, it’s been a hectic day. But you could go check out friend of Axe Cop Michael Regina’s new project on Kickstarter, Adamsville. 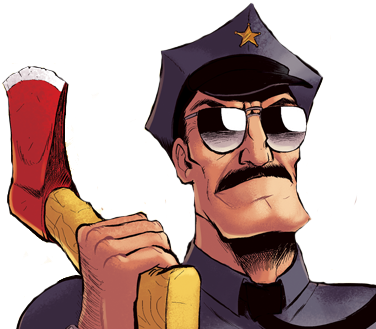 I’m sure I”m not the only one, but I can’t read Axe Cop now and NOT hear Nick Offerman’s voice in my head. Before I even knew who Nick Offerman was, I heard his voice coming out of Axe Cop. 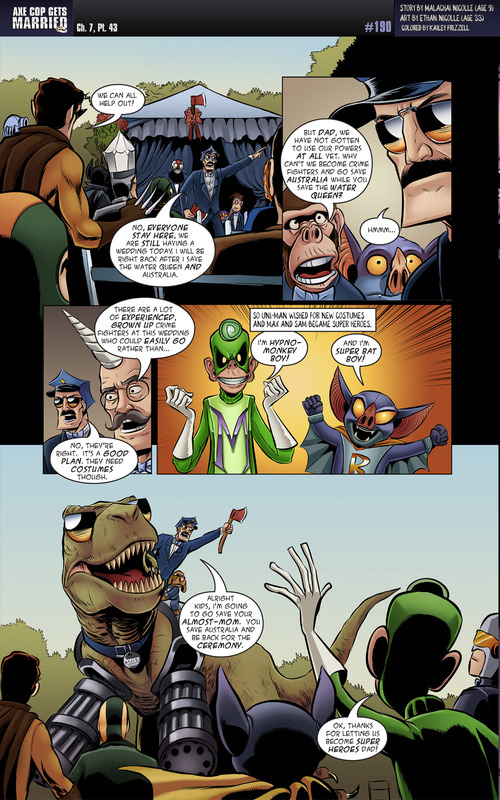 Axe Cop delegating? Fatherhood really IS mellowing him out! I love Sam and Max’s costumes. Obviously he’s, Pallet Swap Man! With the power to swap the pallets of anything! I just noticed the same thing happened to the Water Queen’s jumpsuit, going from black in the middle and blue on the sides in #188 to blue in the middle and black on the sides in #200. I gather there is probably a page coming up with your depiction of Australia on it. On behalf of all Aussies, please please please don’t draw us as the stereotypical, crocodile Dundee version that is so prolific in America. Gray Diamond is one of the super heroes that lives in the city with Bat Warthog Man. Powers: Super genius (he has a huge brain inside the main diamond on his head) and he can turn his hands into diamond swords that also shoot diamonds. Recent Appearance: Page 202 - I object!